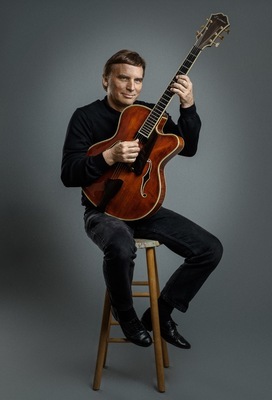 Craig Hlady, originally from Chicago, is a talented guitarist, composer and arranger. Well versed in a variety of musical styles, he has played on and produced hundreds of studio recording sessions, and has toured the U.S.to New Zealand as a sideman and with his own groups. He currently performs jazz in and around the Boston area with The Craig Hlady Quartet, and and with blues/R&B band The Part Time Lovers . In addition, Craig owns and operates Tower Production and Recording, a studio specializing in artist music production, and music for film and TV in a variety of styles including Pop, Rock, Country, Jazz, a Blues Electronic and orchestral . Craig is also a faculty member at the renowned Berklee College of Music, where he is a Professor of Guitar and endorses D'Addario guitar Strings and Celestial Effects pedals. With a lineup of Boston area musicians including numerous Berklee faculty members past and present, as well as other experienced recording artists, The Dedham Jazz Project sets some high standards. Luckily, Craig Hlady and Friends do not disappoint, and the band?s new album is a solid collection of traditional small combo jazz. Many of the numbers are in a typical laidback lounge style, featuring simple but memorable heads, expanded upon by solo improvisations that are impressive without resorting to inappropriate pyrotechnics. In keeping with the best of the tradition, the songs establish moods evocative of their titles without the benefit of lyrics. The very opening of the album provides three solid examples of this in ?6:04 p.m.,? ?Strollin Down the Avenue? and ?Beautiful Silence.? ?Take the Wes Bound Lane? departs only slightly from the preceding tracks with the inclusion of the Hammond B3 organ, creating a slightly more modern edge, appropriate to the title. It is followed by the more obviously dissimilar ?Snowflakes on my Windowsill,? the sole vocal track, on which Rebecca Parris is absolutely captivating, exercising an easy command of her throaty, velvet voice. Other notable variations include ?Enchanted Forest,? in which Hlady?s acoustic guitar almost sounds like a mandolin as it intertwines with the cello, and ?Fourway Street,? which has a noisier feel, replete with disjointed rhythm work and more aggressive soloing, especially Les Arbuckle?s tenor sax. Craig Hlady and Friends deliver the goods; there is not a bad track on The Dedham Jazz Project. An eminently enjoyable listening experience.